I find human kind the most baffling things on the planet. For a start they use the word "civilized" to describe people. How does that work for you? People do the most amazing things to each other, and that's not even beginning to delve into the vagaries of the environment, either in communities or not. On an upnote, here's what the community has done for a small penguin colony. 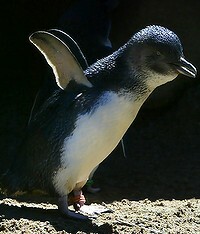 Two marksmen have been employed to protect Sydney's fairy penguin colony after nine were killed in ten days. Snipers will stand guard over Sydney's endangered penguins until vicious attacks on them stop, wildlife experts say. The National Parks and Wildlife Service has employed marksmen to protect the colony of about 120 little penguins at Manly and North Head for "as long as necessary". Nine of the penguins have been mauled to death on the area's beaches in the past fortnight, the most recent at Quarantine Beach on Saturday. It is believed foxes or dogs are responsible. Two snipers spent Sunday night at North Head fruitlessly trying to shoot the animal - or animals - responsible. The National Parks and Wildlife Service says the gunmen, who are just one part of a high-tech response to the deaths, will remain at North Head for the foreseeable future. "We've had no luck so far finding what has done this so we'll keep on trying," a service spokeswoman said. "We'll be there for as long as necessary as part of a pronged approach. "We've got infrared cameras as well to detect fox movements along with fox baiting. "This is really a microcosm of the devastation foxes can wreak in some areas. There's been quite a few bandicoots killed up there in the past too." Autopsies are being carried out at Taronga Zoo on the penguins killed so far, with foxes or dogs suspected over the death due to bite marks on the birds. Dogs are not allowed on national park land at North Head but stray animals could be responsible. DNA swabs are also being analysed to further narrow down the killer. The National Parks and Wildlife Service said the DNA results should be available in the next few days but may need to be sent to experts in Melbourne for further analysis. Manly Environment Centre has mounted its own patrols to guard the penguins. It says efforts have been hampered because some of the attacks have taken place on private beaches where access is restricted. "We've had no deaths in the areas we patrol for the last five years," the group's spokeswoman Angelika Treichler said. She said the attacks were happening at dusk when the penguins return to shore and urged dog owners to keep their animals on leashes.